Inside this small box, it comes packed full of pieces for you to build this awesome glider. Once built, it measures at least half of Mr K! It is that big! This kit is suitable for 8 years old and above. 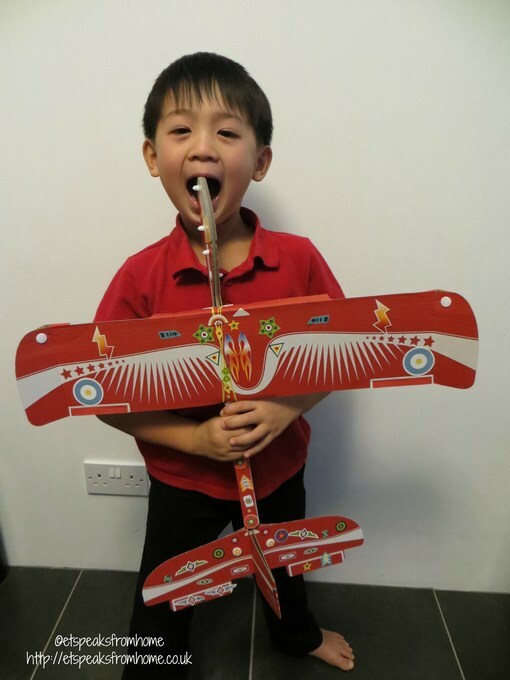 Mr K has just turned 7 and he managed to build the whole glider without my help but just guidance to the step by step and putting the wings together. So younger children who love to build, should be able to use this too. Instructions, clips, 53 stickers, elastic bands are included too. However, you will need 2 x 2p coins and sticky tape to complete this project. The step by step instructions are very easy to follow and includes helpful pictures. Once he fixed the glider, he stuck all the stickers on it. He was so focused with sticking his stickers and made sure it is well finished. The only difficulty was fixing the wings with elastic bands. We needed two pairs of hands to fix it. This is definitely one of my children’s favourite toy! They keep flying it in the house and were so pleased to see it fly a great distance. They can’t wait to take it out but we will have to wait for a dry day as it’s been wet and misty lately. Occasionally the wings do come off as they are only secured by two elastic bands. But it is quite easy to fix back together. Also if the glider nosedives, just bend the flaps up on the tails. The instructions also gives you a few tips to launch your glider with a nice smooth throw! I would recommend this kit from Parragon and it is available to buy from Amazon.